And it is true that even before the internet I was a good correspondent, writing to people I met on my travels and always answering cards and letters I received. I was one of those people who always sent out a long Christmas Letter (loved by some and loathed by others) and I have to say, I always looked forward to receiving the same and discovering what others were doing with their lives. I would send Christmas Cards and newsletters out to maybe 300 – 400 people and the result is that we have stayed in contact with people from all stages of my life – first girlfriends, High School friends, classmates from University, Workmates in Australia and 30 years of employees and clients of Casterbridge Tours, covering the entire period 1979 – 2011. And this was all before the Internet and Facebook era, which makes finding old contacts and/or keeping in touch so much easier! After arrival in Tasmania we had a quick look around Launceston, a veritable treasure trove of historic colonial architecture. Ironically I am not on Facebook, easily the most popular form of Social Media and a great tool for keeping in touch to whatever degree you want with friends. I should stress that is not because I have any objection to Facebook or to using it – in fact more of the opposite. I have never had the time to sit down, learn all about Facebook and set it up. ‘I haven’t got the time Jon’, I replied, ‘but when I am finished with Casterbridge, I will be sure to get on Facebook’. ‘I am not sure that’s a good idea, as Michael would probably get addicted and spend all his time on Facebook’. As Sharron rarely, if ever, reads these articles, and does not follow me on Instagram, another great Social Media tool (and owned by Facebook) for keeping in touch with people, I am sure she would not be a Facebook friend and I am sure I would feel I was intruding if I was to visit any of our kids’ Facebook pages. Don and Lyn Schumacher live on a smallholding near Deloraine in Northern Tasmania. I had not seen Don since we were teaching colleagues in Sydney in the mid 1970s and indirectly he was successful for much of my success in business over the next 40 years. Anyway, it is now eight years since I sold Casterbridge and I still have not found the time to set up an account, but I use email prolifically, cutting and pasting to keep in touch with multiple people with minimal effort, but sometimes with disastrous results, when you forget to cut an inappropriate comment before forwarding! And to this day I ALWAYS give preference to personal correspondence and emails rather than business correspondence, which reflects my priorities, and that has been the case for 40 years and I still found the time to build two very successful businesses. And most of my correspondence is personalised and not cut and pasted. Don Schumacher and myself were colleagues from 1973 – 76 at one of Australia’s top schools: Sydney Grammar School. How interesting that neither myself (extreme right 2nd Row) nor Don (Second from the left end, third row) chose to wear a formal academic gown! 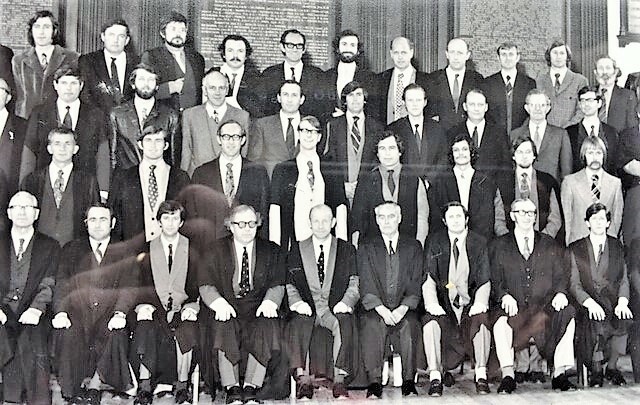 Legendary Headmaster Alastair Mackerras, 4th from the left on the front row, was from the most brilliant of Australian families with all five brothers having a major impact on Australian Society, most notably the Conductor Charles Mackerras, Director of Music at Covent Garden London. Whilst I have always been good at keeping in touch with people, conversely I am not someone who is particularly interested in reunions and certainly not in looking back and reflecting on events past, although two years ago I did get involved in organising a first reunion for our University Class (1967 -70). There are so many interesting things to do that I am always planning for the future, rather than looking at the past, although it is of course always good to catch up with old friends. The murals of Sheffield are one of Northern Tasmania’s quirkiest attractions. Early February 2016 saw Sharron and I in Melbourne Australia, again having visited our daughter Lisa and her partner James in NSW and then spending 10 days at the Australian Open Tennis in Melbourne, watching Andy Murray again narrowly fail to win his maiden Australian title, despite being one set all in the final against Novak Djokovic. And talking of Old Friends, whilst in Melbourne we had met the Australian former Lawyer Finlay Davis, who had visited us in the UK in 1984 upon the recommendation of a friend and who subsequently decided to set up his own Travel Company. We also met Peter Thompson as he, Sharron and myself had all met each other for the first time in Mt Hagen in Papua New Guinea in January 1977. I told you I was good at keeping in touch with people! In fact I had seen both Finlay and Peter from time to time over the last 30 years, but after the tennis Sharron and I planned to fly to Tasmania to catch up with two old friends, neither of whom I had seen for a long time, in fact a very long time indeed! We had not been to Tasmania since 1985, when we went to Hobart to try and recruit a school group to travel to the UK with Casterbridge Tours, but our reason for doing so on this occasion was because I had recently received an email from Don Schumacher, wondering where I was and what was I was up to, and also inviting us to visit, if we were ever ‘Down Under’ in Australia. 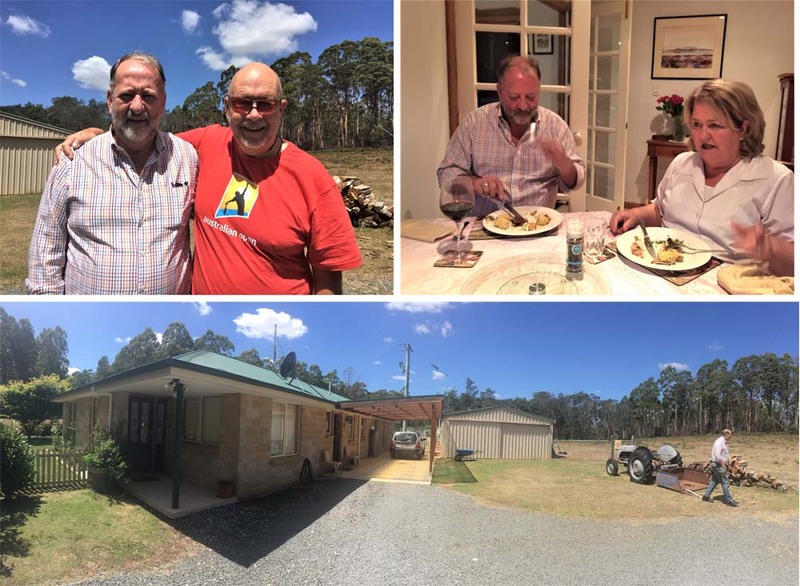 As we planned to be in Melbourne for the tennis, it was a relatively short hop to fly over to Tasmania and visit Don and his wife Lyn, especially as another old friend was also living in Tasmania and not too far from Don and Lyn. 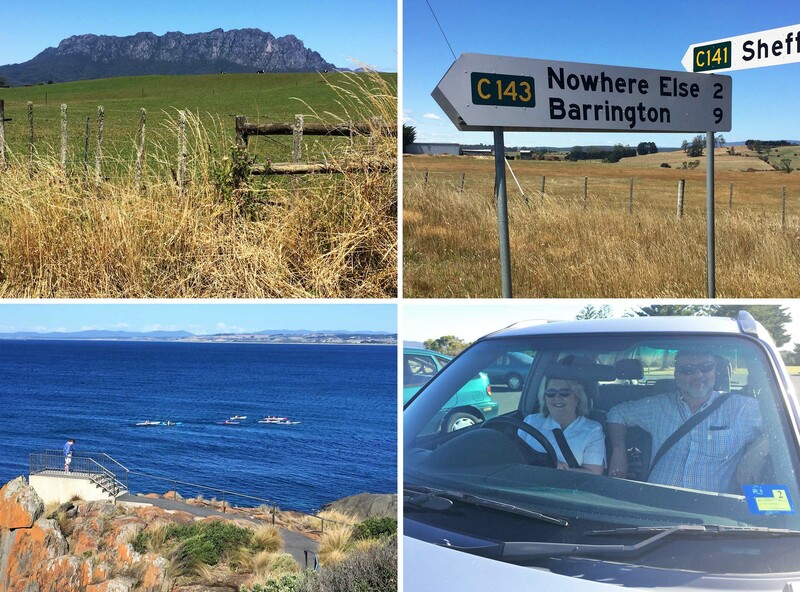 We spent an enjoyable day exploring North East Tasmania with Don and Lyn Schumacher. We landed at Launceston, Tasmania’s second city and, after picking up a rental car at the airport, spent some time exploring the historic centre, replete with many very attractive historic buildings built in a colonial style. And then we were heading east on the 70 minute drive to Don and Lyn’s home. 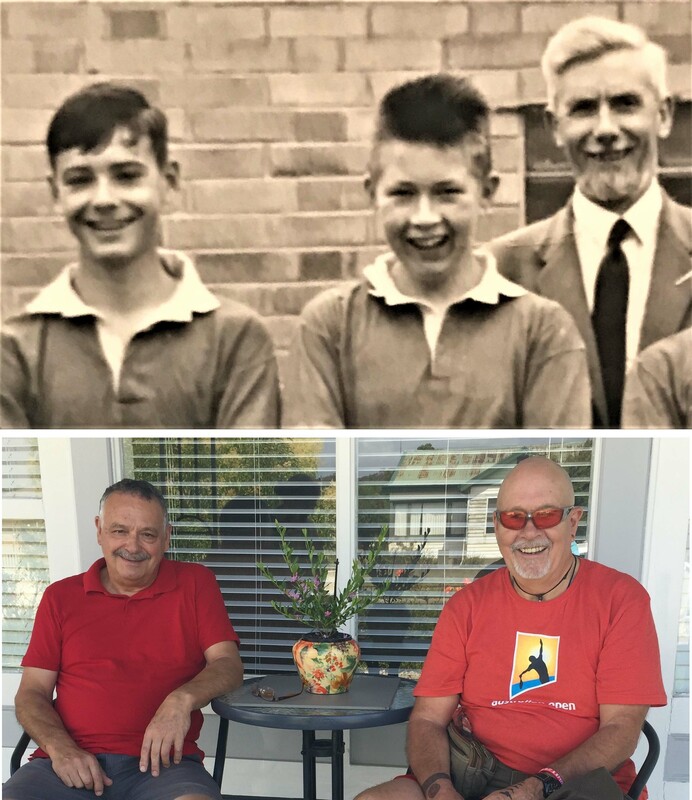 Don and I had met in February 1973, when we had both started as teachers at one of Australia’s most prestigious schools, Sydney Grammar School, on the same day, he as a teacher of Biology and myself as a Geography teacher. Although an Independent school patronised by the great and good of Sydney’s society, the school was under the leadership of a liberal and freethinking headmaster, Alistair Mackerras, who strangely enough believed the school’s first responsibility was to the boys – it was an all boy’s school -rather than the parents, old boys or staff room. He did not believe there was anything to be gained in making it mandatory for all boys to play a sport (after all, it was not much fun either coaching or playing in the Under 13 5th XV Rugby team) but rather the students should do something constructive, be it Sport or Music or Drama or Social Work, helping less fortunate members of society and his room was always open to students. How different to my last days in school in the UK, just five years earlier, when I avoided going anywhere near the Headmaster’s office, in case he sent me home because my hair was too long. It was in this liberal environment and in response to demand from the students and against the wishes of the Old Boys and Establishment, that it was agreed that Football (soccer) should be introduced with (just) one team per age group. I had not seen Michael Wurzer since 1965, 51 years previously. Have we changed much? It was Don and I who were appointed as the two coaches and, incidentally, given the title of this piece, I should comment that I am still in touch with several students (and one set of parents!) that I coached over 40 years ago. Those were good times for me, living and working in a beautiful city. Don and I became friends and discovered we had a shared interest in horse racing and gambling, although I was a relative newcomer to the sport, as my interest had been initiated by my daily bus ride to school, which went past Randwick Racecourse, one of the world’s great horseracing tracks. One day Don told me he had bought a horseracing ‘system’ and showed it to me. I am not exaggerating when I say it was to fundamentally change the course of my life! 1 Only consider races at Rosehill Racecourse. 2 Only consider races of 1200 metres to 1400 metres. 3 Only consider races for two year olds. 4 Eliminate all horses that did not come first or second at their previous start. 5 Only consider horses which are ridden by one of the top three jockeys. 6 Only consider horses that are trained by one of the top three trainers. 7 Place $20 on all horses that meet the above criteria. Of course the system did not work or came up with just a few short priced selections but I was intrigued. So Don and I started going to the Sydney City Library and analysing the past 6 months of horseracing and harness racing results and I devised a system called ‘Trotterific’, which I started to sell for $15, with advertisements in the Racing Press and, by paying some of my 6th Form Students $10 to distribute fliers to losing punters as they left Randwick Racecourse. Mike and Kay Wurzer had retired to Beauty Point in Northern Tasmania to be nearer their children. Most of my colleagues at Sydney Grammar School thought I was a ‘Mad Pom’ and one or two did not consider it was appropriate for staff members to be recruiting the students at a fee paying school to distribute fliers on the street. However, I had struck a goldmine and, over the next 5 years, sold over 25 different betting systems from Post Boxes and rented dilapidated offices (just used as a mail drop) all over Sydney. I just smiled and did not tell him that from 4pm to 2am I was just processing orders for systems, researching new systems, designing fliers and I was earning 4 times more from selling systems than I was from my day job as a well paid teacher! My mother had flown out from the UK to help me, as did my and girlfriend at the time, Heather, who I still see for a coffee every other year or so. Fairy Penguins coming ashore at Low Point and passing between the Rangers Legs. In 1978 I left Australia with significantly more than the $5 with which I had arrived and used the funds I had accumulated to purchase a former hospital in the UK, which my wife and I renamed as Casterbridge Hall and used as a base for American students. Casterbridge Hall evolved into Casterbridge Tours which we grew into one of the world’s biggest (and Queen’s Award winning) Educational Tour Operators which we sold in 2011! So, as we approached Don and Lyn’s home, I could not but help supress a smile – I had a lot to be grateful to Don for, showing me that slip of paper 43 years earlier. I am a great believer that for most of us, excepting the few who find God or successfully manage to reinvent themselves, our personalities, complete with idiosyncrasies, strengths and weaknesses, are pretty much formed by our early twenties and, although Don and I had not seen each other since 1976, we pretty much took off as if it was yesterday just catching up and filling in the blanks. Don and Lyn lived in a single storey Rancher style house that they had built in 2002 on a smallholding of about 20 hectares ( about 50 Acres). I thought the last time I had seen Don and Lyn was in 1976 but he corrected me and said that when I came back to Australia in 1977 to continue my system selling activities after 6 months of travelling around South East Asia, I had stayed with them for a couple of nights. I could not remember that. Don had also left Sydney Grammar a few months after me in 1979 and, after five years of teaching at Barker College in Sydneys Northern suburbs, had started teaching at Launceston Grammar in Tasmania and had been there ever since. In fact he told me he was currently on long service leave and planned to hand in his notice before he was due to return, so as far as he was concerned, he was officially ’retired’ and his hope was that they would sell their house and relocate to Port Macquarrie on the central NSW coast and incidentally where our friends John and Debbie Baker, who we were also planning to visit, lived. …………….and the Cataract Gorge Park in Launceston. However there was one catch. Don had used his horticultural skills to grow Ginseng, for which there is a significant demand in China, so he had appointed a representative in Hong Kong to market their property in Tasmania to the Chinese market, on the basis of the value of the Ginseng crop in the ground. I think he said there was only one other Ginseng grower in Tasmania. Although they had already had a viewing, they were planning to appoint a new agent to represent them in China and realised that identifying a Chinese buyer interested in purchasing property in Tasmania on the strength of its Ginseng stock might fairly be described as a limited market………….or long shot? Whilst Don was fairly optimistic, he and Lyn were also quite prepared to spend part of their retirement in Tasmania (or ‘Tassie’ to the locals), where they had lived happily for almost 40 years but at the same time would be happy to relocate to a new area and make new friends. 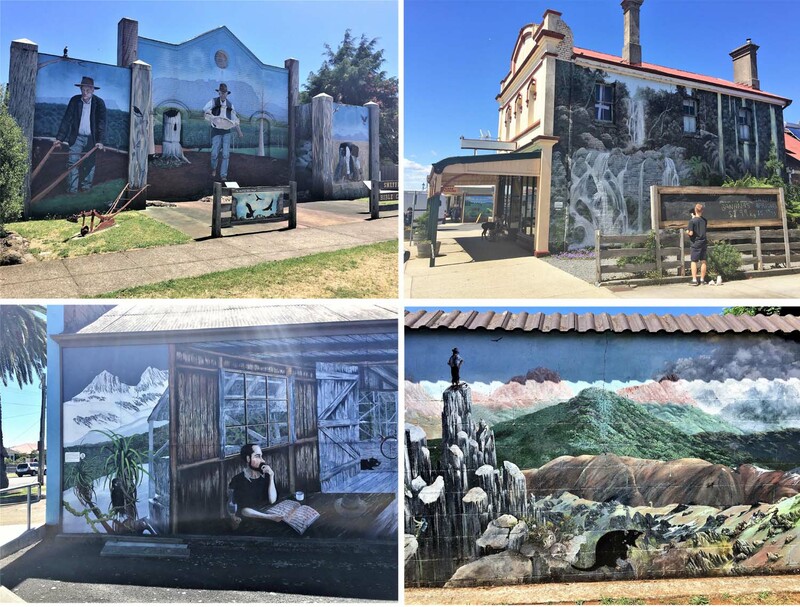 The following day, we made a tour around part of Northern Tasmania with Don and Lyn and one of the highlights was visiting the town of Sheffield, which had made itself into a tourist attraction with an extensive collection of murals decorating many of the buildings. We could see Cradle Mountain , an area I would like to visit with our daughter Lisa, to attempt the six Day Overland Track, perhaps Australia’s best known long distance trail. 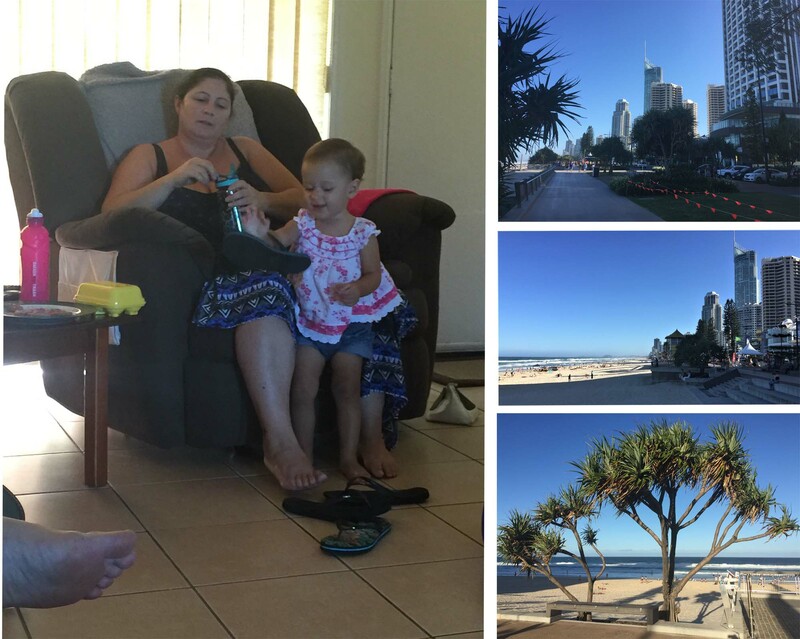 It was good to visit Katie Boast and her daughter who live near Surfers Paradise, Australia’s premier Holiday Resort. Katie worked for us as a Nanny in the early 1990s and we have remained friends ever since. After ending on the coast at the Mersey Bluffs headland near Devonport, we went back to Don and Lyn’s for a lovely dinner and the following day, after chatting and exploring the property, we were on our way, hopefully not having to wait another 39 years until we meet again because that just ‘ain’t gonna happen’! In fact, as Don and Lyn have a daughter who is living in the north of England and whom they are planning to visit, there is a chance we could meet up on their next visit to the UK so we can repay their hospitality. If I thought meeting up with Don after what I thought was 40 years (until corrected to 39) was a long interval, that was nothing in comparison with our next visit, which was less than an hour’s drive away at Beauty Point. I had gone to school with Michael Wurzer from 1957 until 1965 (ie from the ages of 8 to 16) at two schools in the northern part of Bournemouth, on England’s south coast. It was great to stay with Brian and Judy Leiper at Coff’s Harbour. Sharron used to share an apartment with Judy in London in 1970! Although Bournemouth as a town is considered to be one of the more affluent cities in the UK, we both lived in Council Housing provided by local government for families who could not afford to own their own homes. And neither of the two schools that we went to – West Howe Junior and Oakmead Secondary Modern were renowned for academic excellence in post war Britain and in fact I was only the second person from Oakmead to actually make it to a university. Both Michael and I had failed the infamous 11+ exam that all students took at the age of 11 in the UK. This was a mixture of IQ tests as well as English and Mathematical tests to identify the most academically gifted who would be fast tracked to Grammar Schools for the brightest students, whilst the rest of us who failed their 11+ were sent to Secondary Modern Schools, where Rural Studies (Gardening), Metalwork and Woodwork would also appear on the curriculum. 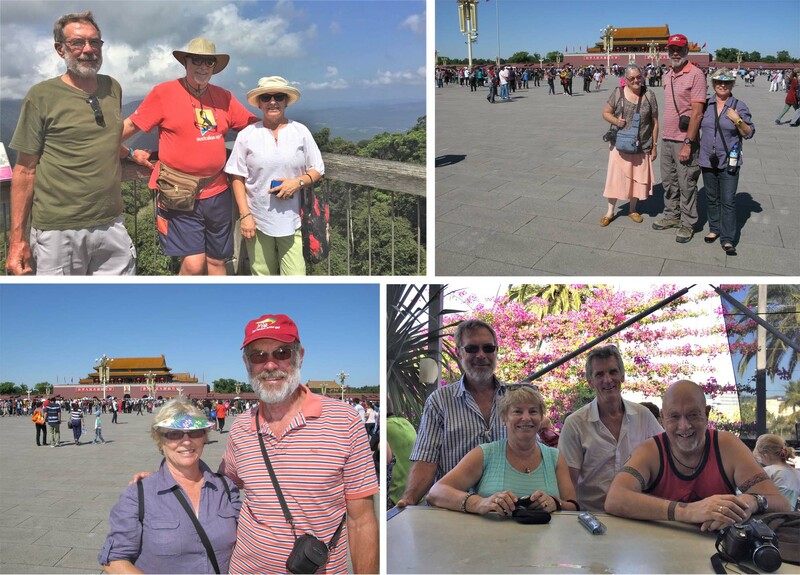 Although I had met Brian and Judy briefly in Brisbane the previous year (with John Baker) Sharron had not seen Brian and Judy since 2012 when we travelled by train together from St Petersburg to Beijing on the Trans Siberian and Trans Mongolian Expresses. Of course it was inevitable that those of us who failed their 11+ considered themselves ‘failures’ and mentally doffed our hats to those former classmates who had made it to the Grammar School for the brainy kids. And interestingly enough to this day, one of the comments I will often make in a discussion is to say ‘I am not stupid’ and my wife will often say ‘No one is saying you are’. I am sure I use the expression as a natural defence mechanism from those years when I was considered a failure. Of course, the teachers would tell us that to be in the top stream at the Secondary School was no different to being in a lower stream at the Grammar School ……………but they would wouldn’t they! 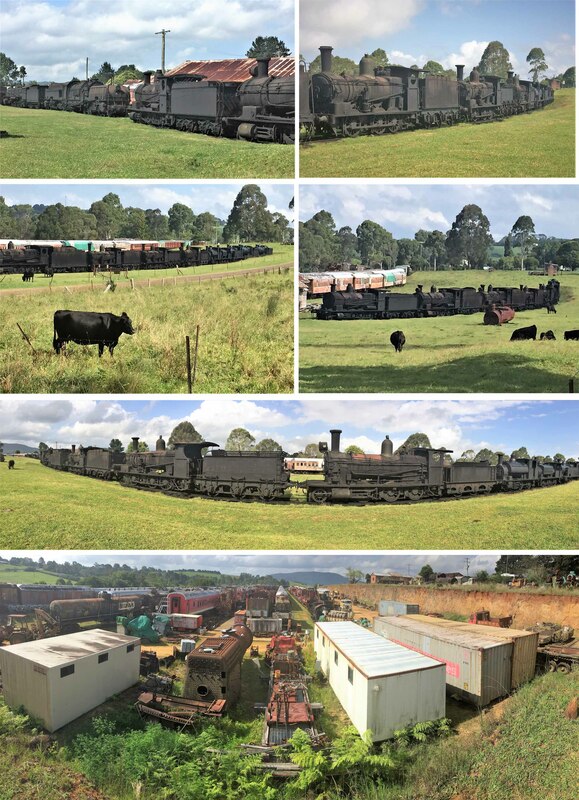 The Railway Graveyard at Dorrigo, inlands from Coffs Harbour, was one of the most unusual and unexpected attractions I have ever seen in almost 50 years of visiting Australia. The object was to create a Museum but not unexpectedly planning permission was not easy and the local authorities and the idiosyncratic railway enthusiast (who we met on site!) behind the project never seem to be on the same page! As it happened it worked for me because at the age of 16 I took my ‘O’ Level Exams and did well enough to transfer over to the Grammar School for the last two years of my High School education, so proponents of the 11+ selective system would use me as an example to say that the selective system works and the cream rises to the surface and can switch over to the better schools at a later date. That may be but I think that most of us at Oakmead considered ourselves there because we had ‘failed’ and were just marking time until we went out and got jobs at the age of 15 or 16. I had never been particularly close to Mike Wurzer, but we had been at the same junior school and, after we both failed the 11+, transferred to Oakmead, where we both played in the same rugby and football teams. It was very unusual for a secondary modern school to play rugby which was usually the preserve of private schools only but our head teacher wanted to raise the prestige of the school with rugby games against private schools and also our own brass band under the direction of Mr Bosanko. In Port Macquarie we stayed with John and Debbie Baker and our daughter Lisa joined us from Sydney.Their son Phillip was also around. And like his Dad Philip is a teacher and soccer enthusiast. John was a Tourguide with our company Casterbridge Tours in 1983! My abiding memory of Mike was that as he got older, he developed into an outstanding athlete and was the fastest runner in the school and one of the fastest schoolboy athletes in the town of Bournemouth, with a then population of around 150,000. And the last time I had seem Mike was at our last day of school in 1965! The way we had got in back in touch was a testimony to the power of the internet and/or Social Media. At some point perhaps 10 or 15 years earlier, I had registered my contact details on the ‘Friends Reunited’ Web site for our school and Mike had seen it and made contact with me from Queensland Australia, where he was working as an Engineer. He had subsequently retired to Tasmania with his wife Kay about 6 years earlier. I had met John and Phillip at both the FIFA World Cup in Brazil in Sao Paulo 2014 and at the Asian Cup in Brisbane in 2015. We arrived at Mike and Kay’s home at Beauty Point mid afternoon and it was clear that neither of us were quite the supreme athletic specimens that we had been 50 years earlier, but we had an enjoyable time catching up and comparing notes and what little information we knew about our former classmates from 50 plus years ago! 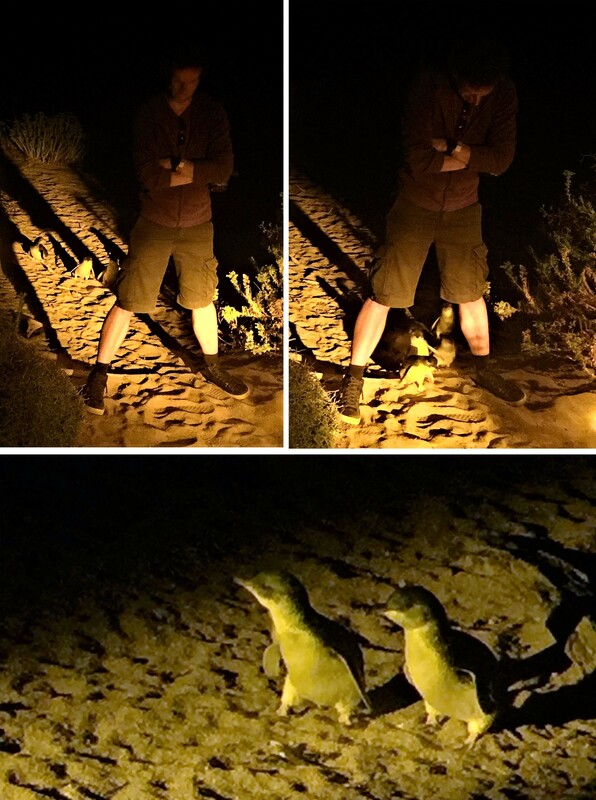 That evening we went to the nearby spot of Low Point to watch the Fairy Penguins wade ashore and waddle around in the dark between the rocks. The Penguins might not have been either as big or as numerous as in Antarctica, but it was very interesting nonetheless! 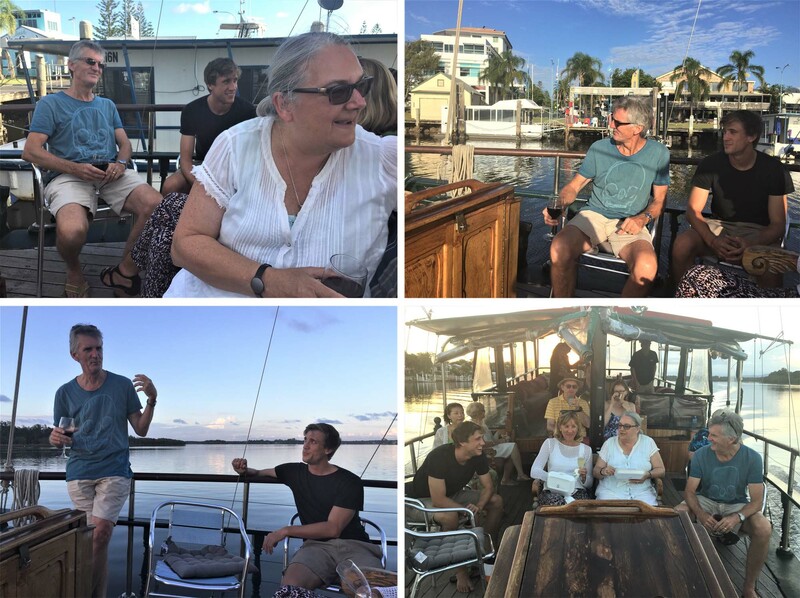 We had a great evening cruise on the river at Port Macquarrie with John, Debbie and Philip complete with Aussie Fish and Chips! Mike had emigrated to Australia in the mid 1970s and and since that time, had only returned once to the UK and was not over impressed, deciding he had made the right decision to relocate ‘down under’ to Australia. He had two children working in Melbourne and Hobart, so living in Northern Tasmania was conveniently between them both. The following morning we chatted and reminisced and it was clear Mike had a much better recollection than me of times past and he also had an interesting collection of newspaper cuttings from times past and our days in Bournemouth. I don’t think Michael and Kay have any plans to revisit the UK, but they did say they may like to visit South East Asia so maybe that’s where we will next meet up? On our way to Launceston Airport, Sharron and I made a brief visit to the Beaconsfield Gold Mine Visitor Centre and a slightly longer stay at the Cataract Gorge Park in Launceston, before we returned our hire car and took a late afternoon flight to Brisbane in Queensland and another hire car, as we were to drive north to the Sunshine Coast, where we were due to stay for 10 days with her cousin Lindy and her husband Jim. From there we drove south to Sydney, visiting a number of friends from times past. At Surfers Paradise, we stopped to say Hello to Katie, who in the early 90s, had been a Nanny, helping Sharron with our three children. In Coffs Harbour we stayed with Brian and Judy, with whom Sharron had shared a flat in London in 1970 and whom we had seen more recently, when travelling from St Petersburg to Beijing on the Trans Siberian in 2012. (You can read an account of that journey here). We spent an enjoyable two days exploring the coastline around Coffs Harbour before venturing inland where we discovered an amazing railway graveyard at Dorrigo the likes of which I had never seen before with dozens of railway engines and carriages literally parked in empty fields. 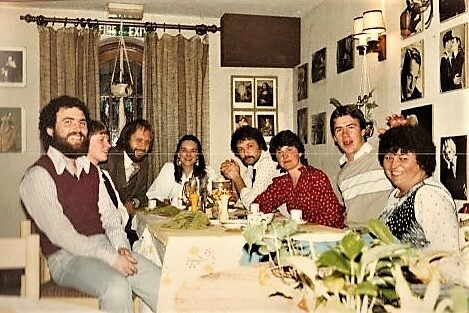 Paul Power (second from right) was a tourguide with Casterbridge Tours in 1983 and 1984. My wife Sharron and I are at the rear. Miranda third from the right also attended my recent 70th Birthday! We continued southwards following the NSW coastline until we reached Port Macquarie, where we stayed with John and Debbie Baker. John had been a Tour Guide for Casterbridge Tours in 1982 and we had stayed in touch. He was now a Deputy Principal and we had met up a couple of times in the 1980s in Australia and then more recently seen him in Brazil for the 2014 FIFA World Cup, where he and his son Philip were supporting Australia and in 2015 in Brisbane, where I combined a visit to Australia to see our daughter Lisa with some games at the Asian Football Championship with John and Philip. And in Newcastle we stayed with Paul and Phil Power. Paul had been a guide with Casterbridge Tours in 1983 and 1984 and we had met up from time to time, notably in Perth in the late 90s, when I was escorting my mother on a cruise and in Murren in 2008, when Paul and Phil visited with their three kids and I took them on a couple of days hiking. In fact later this year, Paul was bringing a group of mainly Australian friends to Switzerland and I was leading them on a 16 day hike from Murren and the Lauterbrunnen Valley to and around the Wildstrubel Circuit, before ending up in the beautiful Lotschental Valley. Paul invited some of the group around, so I could brief them on what they were letting themselves in for! So in retrospect, as I finalise this article 36 months later, although I always remember my 2016 visit to Australia as the time I met two friends who I had not seen for a collective total of 89 years on almost successive days, I did in fact meet many other old friends on the same journey. In 2009 Paul Power brought his family to stay with me in Switzerland. I wrote this article in October 2017, as my wife Sharron and I came to the end of a four day rail journey from Toronto, across the Canadian Prairies and through the Rockies to our home in Vancouver , a journey (if not a train!) that started in Iceland and came to Toronto via Greenland and Baffin Island! And as I gazed at the Fraser River Canyon, I realised that I keep in touch with a lot of old friends from decades past and this year alone (2017) I have been in a quiz team in Sydney Australia with Paul Kiff (like me, passing through the city) and John Connell (a professor at Sydney University), who I both met when a student at University College London 1967 -70. A few days later, Sharron and I were at the Australian Open Tennis with Bill and Vanessa Clarke and I also met Bill in the 1960s during my university days. I went to both the French Open tennis at Roland Garros and a Pet Shop Boys Concert in Nottingham (UK) with David Walker, a fellow Tour Operator who I met at a BITOA conference in Portsmouth around 1990. And when we were in Paris, we met with Vinnie, as I have done on virtually every visit I have made to Paris since she worked for us, managing the kitchen at Casterbridge Hall in 1984. I first met Richard Trollope when, despite being labelled an 11+ failure, I was allowed to transfer to the prestigious Bournemouth School in 1965 and Richard and I travelled overland through Asia together in 1972 for 4 months. This year I have hiked with Richard in Thailand, Switzerland and back in the UK in the New Forest. Our friend Alison, who we hung out with in 1965, joined us for our walk in the New Forest and is as energetic and enthusiastic about life as always, but another friend, Steve, from our schooldays could not join us, as he appears to have disappeared in America! At least last year Steve did manage to make it to Wales with me to watch Wales vs Georgia in a World Cup qualifier. In Newcastle we stayed with Paul and Phil Power who were planning to bring a group to Switzerland to hike with me 6 months later. I had already left the UK for Iceland and Greenland, when my old pal Julian from the 1960s visited the UK, but on his last visit eight years ago, we had managed to go and camp at the Glastonbury Festival together for four days, which was great fun. In Switzerland this summer I was honoured with a visit for the second successive year from Barton Zedd, a 17 year old student on a Casterbridge Tour in 1984, when I was the Tour Manager and guide. He is now a 50 year old lawyer in Virginia. And I went to the Montreux Jazz Festival this year with Simon Russell, son of my good friends Charlie and Giesla. I well remember pulling a four year old Simon out of a pond at a pub at Henstridge Somerset in the UK 30 years earlier! I met my first girlfriend Suzanne in Bournemouth in 1966, when I was 17 and she was 16, and she has lived in Munchen since the 1970s, when she married Vassya. As the female who has known me the longest, she has now claimed the right to be my self appointed relationship Advisor! Although I have not seen my friend Jim who I met in Fiji in 1975 this year, he did visit me in Thailand a few years ago, and was recently in touch to rightfully (?) correct me for blaming all Americans for the debacle in imposing the clearly not fit for purpose Trump on the rest of the world. 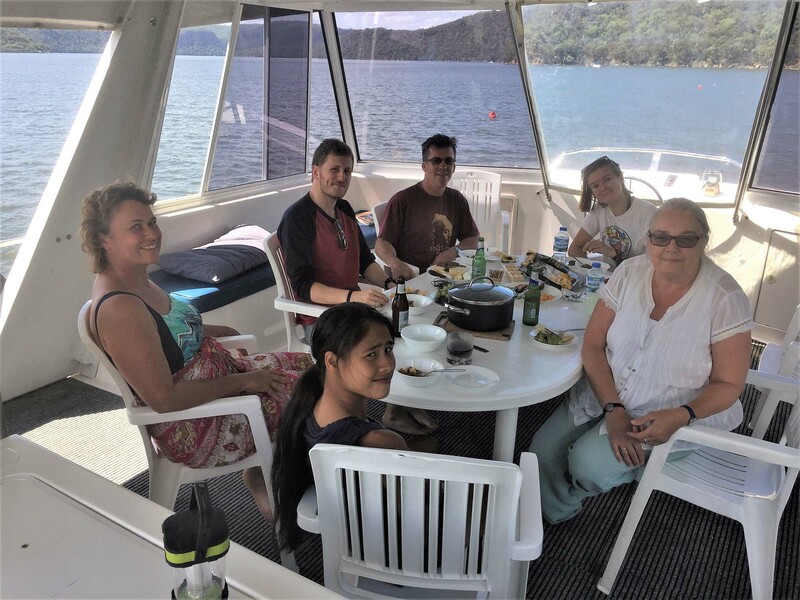 A few days later together with our daughter Lisa and future son-in-law James we enjoyed the company of the Power family on the Hawkesbury River. Whenever I stay at our apartment in London, I am reminded of another old friend, Irene Chan, whose family rented an apartment for her in the building next door, when we both studied for our MAs together at the School of Slavonic Studies at the University of London in 1970 and 1971. I was able to catch up for dinner with Miss Chan in Kuala Lumpur two years ago and you can read about it here. As I said when starting this piece, I am not someone who spends much, if any, time recollecting and looking back but clearly my track record shows I am someone who values friendships and staying in touch, even though talking with someone you have known for 40 years is a very vivid reminder of our own mortality! And that is something I am happy to deny and avoid, which is perhaps why in Asia I have many new and younger friends who keep me on my toes! My friend and former colleague Tony also lives in Thailand for seven months annually and only a 5 minute walk from my own home, so Tony is readily able to bridge the divide between friends old and new. I am a great believer in the value of friendship and of staying in touch with old friends……..but not at the cost of making new friends, because surely there is a place for both in our lives. Old Friends help us treasure fond memories. New Friends keep us young and present new challenges. And that’s why I need a Relationship Advisor! Or did in October 2017 when this was written! The events described in the article largely took place in February 2016 and the article was written in October 2017. But for various reasons, it is only now (March 2019 at Mae Hong Son in Northern Thailand) that I am editing and correcting the article and selecting images. Two months ago I turned 70 and had two parties to celebrate and many ‘old friends’ mentioned in this article honoured me by attending. In the UK, school friends included Richard Trollope (who co-ordinated a surprise photobook from several friends form the 60s and 70s) and Steve Hopkins (no longer lost in America) were amongst the 1960s Bournemouth School students who attended. My first girlfriend Suzanne made the journey from Munich and Vinnie came from Paris. Amongst many friends from my undergraduate days at UCL were Charlie and Gisela Russell, who made the journey from the Black Forest in Germany. Two weeks later I had another party in Thailand and Finlay Davis made the journey from Melbourne as did former Casterbridge Tourguide Paul Power from Newcastle, NSW. My former colleague Tony Browne, who worked with me at Casterbridge for 27 years from 1984 as fellow Director and Shareholder, was present, as was fellow Tour Operator David Walker. Please do not take offence at not being mentioned in this postscript, as I have just identified those who were mentioned in the original article. Over 70 mainly ‘Old Friends’ attended the two events and I was pleased and honoured to see every one of you.